ATE Impacts 2018-2019 is available free-of-charge to anyone who wishes to use it in conducting outreach around the ATE program's successes. 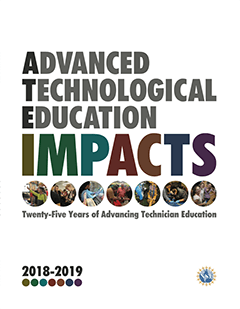 An electronic version (PDF) of the ATE Impacts 2018-2019 book is available for download below. Free print copies of the ATE Impacts book, to distribute on your campus, to you industry partners, or elsewhere can be obtained via the book request form. Already have copies and want to tell us how you've used them? Please fill out our brief survey to help us understand more about the impacts of the book. Want even more Advanced Technological Education? Visit the ATE Impacts Blog, for more stories about the fantastic work done by the ATE community every day!